Featuring one of the key characters from the bestselling Tiger's Roar, Rabbit's Hop is Rabbit's 'origin story' - a celebration of recognising your strengths, accepting help, encouraging others and enjoying friendships and sport. Another funny and inspiring picture book by AFL Premiership player, Alex Rance, and talented children's book illustrator, Shane McG. Jack Rabbit loved Rabbit Island. He loved his friends and family and all the little rabbits. He loved being the best at hopping and chomping and (nearly the best) at zigzagging. But Jack Rabbit was restless. So when his cousin Roo invites him to Big Island, he's very excited - and a little bit scared. 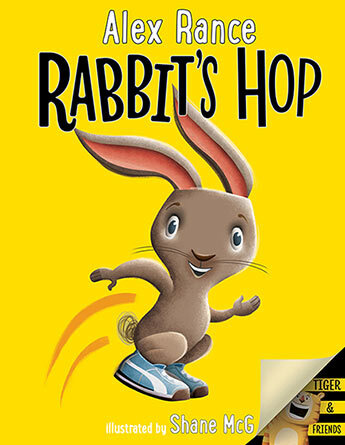 Can he overcome all the challenges and get to Big Island and become the best Rabbit he can be? A wonderfully entertaining picture book about self-belief, determination, being kind and having fun. Alex Rance is a champion AFL footballer with the Richmond Tigers. He was a key player in Richmond's drought-breaking 2017 AFL Premiership win. Off-field, Rance looks to inspire the next generation to realise their dreams. His first picture book, the bestselling Tiger's Roar, was published in 2018. Shane McG is an award-winning picture book illustrator. He has also exhibited in London and Melbourne.